Find here the most important terms and their description for Electronic Data Interchange (EDI) in the automotive industry. For more questions please contact us by by e-mail or phone. AS2 (Applicability Statement 2) is a transfer protocol for the electronic exchange of data between business partners based on an HTTP protocol with standardized S/MIME content. ASN (Advanced Shipping Notice) is a notification of pending deliveries. An ASN usually provides information on the time of shipment and characteristics about the shipment so that the customer can be prepared to accept the delivery. It is an essential part of just-in-time processes. It is implemented e.g. by the EDIFACT DESADV message, VDA 4987 or X12 EDI 856 standards. CAD (Computer-Aided Design) and CAM (Computer Aided Manufacturing) is used for high-precision product design, modeling and creation. CAD files and CAM files can also be exchanged electronically and in an automated way via EDI. CALDEL (Call delivery) is an ODETTE-defined EDI message based on the EDIFACT DELJIT (DELivery Just In Time) standard. It contains short-term delivery instructions for just-in-time delivery to the assembly line. CCF is an EDI clearing center provided by TELEDIN. It was specifically developed for the automotive and retail industries. 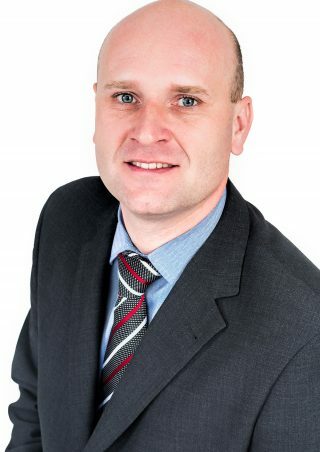 The service offers a connection to the most important VANs and supports all current EDI standards such as EDIFACT, ODETTE, VDA or X12 and message formats used by ERP and WMS vendors such as XML, IDoc, positional text files or csv. DELFOR (Delivery forecast and instruction) is an EDIFACT message used during the order process in the automotive sector. 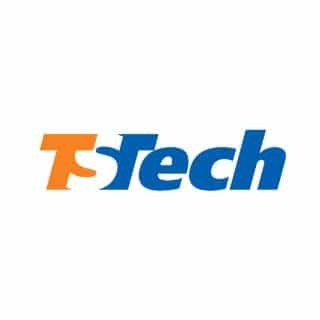 It is sent by the OEM (Original Equipment Manufacturer) to the supplier to provide scheduling information as well as requirements regarding delivery dates, quantities, packaging and more. DELJIT (Delivery Just in time) is an EDIFACT message used to instruct the supplier about the precise delivery sequence and just-in-time schedule requirements. It is also meant to supplement the Delivery Schedule Message (DELFOR). The use of this message will facilitate the practice of just-intime (JIT) delivery by providing the customer with a mechanism to issue precise shipping schedule requirements in terms of a 24-hour clock and on a more frequent basis than with the instance of a delivery schedule message, e.g. daily shipping schedules versus weekly planning schedules. 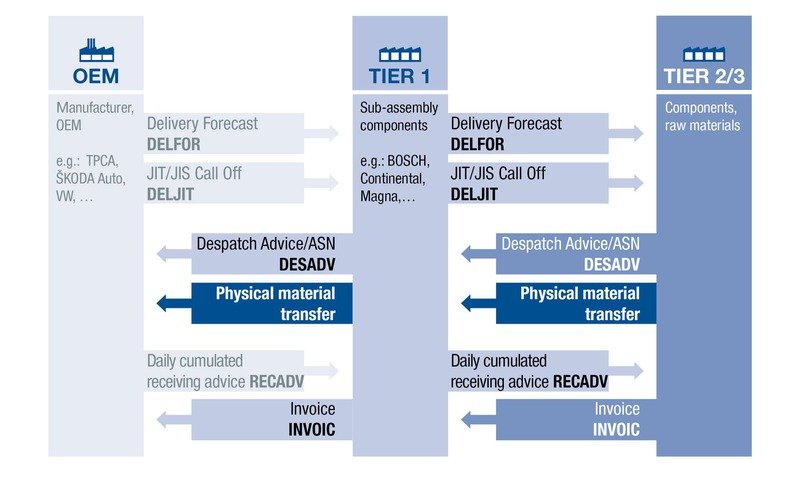 DESADV (DESpatch ADVice) is an EDIFACT message that covers the ASN process and is sent from supplier to customer about materials and parts being physically delivered. It usually arrives before goods are physically delivered to the storehouse or assembly line so that customers can better plan their unloading capacities and production. EDIFACT (United Nations/Electronic Data Interchange for Administration, Commerce and Transport) is the international EDI standard developed by the United Nations to facilitate trading exchange. Widely used in the retail industry, it is also adopted by the automotive industry to facilitate global cooperation between business partners. ENGDAT (Engineering Data Message) is an EDI standard used for the electronic exchange of CAD files (Computer-Aided Design). ERP (Enterprise Resource Planning) System to integrate internal business processes and resources. It helps understand customers better, manufacture more efficiently, and deliver quality products on-time and within budget. eXite is an EDI service provided by EDITEL. It includes comprehensive EDI solutions such as EDI Communication, EDI Integration, e-Invoice, Digital Archiving, Business Monitoring and Web EDI. FTP (File Transfer Protocol) is a client-server protocol that relies on two communication channels between client and server. It is an old protocol which should not be used for mission-critical applications. FTP/S is a secured extension that adds an SSL/TLS security layer. HTTP/HTTPS (Hyper Text Transfer Protocol / Secure) is a request-response protocol for web-based communication that also supports SSL/TLS security. It is the basis for B2B communication protocols such as AS2 or WS-SOAP. INVOIC (Invoice) is an EDIFACT message used to exchange invoicing information between customer and supplier. JIS (Just in sequence) is an inventory strategy which advances the JIT (justin-time) process. Components and parts arrive at the production line exactly (in the sequence) when they need to be assembled. JIS processes significantly increase efficiency and productivity in the production process. They require a precise exchange of delivery and scheduling information usually transmitted via EDI. JIT (Just-in-time) is an inventory strategy developed at the Japanese automobile manufacturer Toyota in the 1970s. In assembly lines organized with JIT processes, parts are supplied when the production process requires them, thus eliminating the need for inventories and storage. 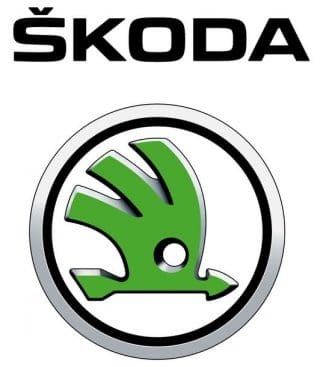 OEM (Original Equipment Manufacturer) is a producer or manufacturer of a complete end product, in the automotive industry such manufacturers include Škoda Auto, VW, BMW, Mercedes-Benz, TPCA, KIA, Jaguar Land Rover (JLR), etc . Odette (the Organization for Data Exchange by Teletransmission in Europe) is a pan-European collaboration and services platform working for the entire automotive network. The network aims to bring together supply chain professionals and technology experts to create standards, develop best practices and provide services which support the automotive industry in its operations. ODETTE created several standardized Automotive EDI messages which are widely used in the sector. OFTP (Odette File Transfer Protocol) is a protocol created in 1986, used for EDI communication mainly in the automotive and manufacturing industries. OFTP2 (Odette File Transfer Protocol 2) was written in 2007 by Data Interchange as a specification for the secure transfer of business documents over the Internet, ISDN and X.25 networks with additional security options. OFTP 2 can work point-to-point or indirectly via a VAN (Value Added Network). POP3 (Post Office Protocol 3) is the most recent version of a standard protocol for receiving e-mail. RECADV (RECeiving ADVice) is an EDIFACT message for sending an explicit goods receipt statement. This message is especially appropriate in processes where the supplier issues the invoice for which RECADV is the most accurate source of information. SFTP (SSH File Transfer Protocol) is a network protocol that provides file access, file transfer, and file management over SSH. While TIER 1 suppliers create parts and equipment, they generally do not produce the pieces that make up those parts. For that, they turn to TIER 2 suppliers. TIER 2 suppliers deal directly with TIER 1 suppliers. In specific cases, TIER 2 suppliers may serve as a TIER 1 and supply directly to the OEM. The last supplier at the end or beginning of the supply chain usually provides raw material such as steel. Depending on the complexity of the supply chain, this can be a TIER 3 or TIER 4 supplier. Tradacoms is an early standard for EDI and was primarily used in the UK. VDA, the German Association of the Automotive Industry (VDA = Verband der Deutschen Automobilindustrie) consists of more than 620 companies involved in production for the automotive industry in the Federal Republic of Germany. The members are divided into three manufacturer groups: automobile manufacturers, automotive suppliers, and trailers, special bodies, buses. The VDA currently has about 35 working groups, which in some cases have set up their own sub-committee or ad hoc working group. VDA4905, a standardized EDI message for the transmission of delivery instructions from the OEM to the supplier, the so-called Lieferabruf in German. VDA4915, a standardized EDI message for the transmission of detailed call-offs from the OEM to the supplier, the so-called Feinabruf in German. VDA4915/2 is a standardized EDI message for the call-off based on the ODETTE message DELINS (Delivery instruction). Web EDI is a cost-efficient solution for small and medium suppliers to exchange EDI messages with their customers and the ideal solution for OEMs to connect all business partners via EDI regardless of the supplier size. X.12 is an EDI standard defined by the standards organization Accredited Standards Committee X12 (also known as ASC X12) and widely used in the USA. XML (Extensible Markup Language) is a data format used in business-to-business transactions.